Explanation: Mt. 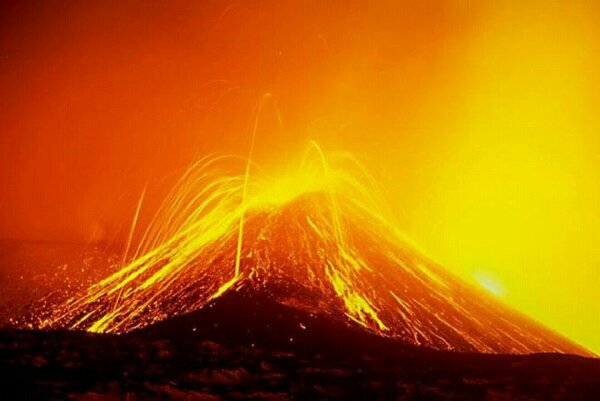 Etna erupted spectacularly in 2001 June. Pictured above, the volcano was photographed expelling bubbles of hot magma, some of which measured over one meter across. One reason planetary geologists study Earth’s Mt. Etna is because of its likely similarity to volcanoes on Mars. Mt. Etna, a basalt volcano, is composed of material similar to Mars, and produces similar lava channels. Located in Sicily, Italy, Mt. Etna is not only one of the most active volcanoes on Earth, it is one of the largest, measuring over 50 kilometers at its base and rising nearly 3 kilometers high.